Feature mom number one today is the woman who raised me with her own sweat, blood, tears, and cheers. First I would like to wish her a very special Mother's Day. I am so honored and blessed that the Lord choose you for my Mommy =)!!! My dear beautiful Mother choose the stay at home path of motherhood. So she spent twenty four seven with my brother and I most days, and lived to tell about it. She guided us along our path to what I call semi-adulthood. I figured we still have much to learn before being able to take on the title of adults offically. 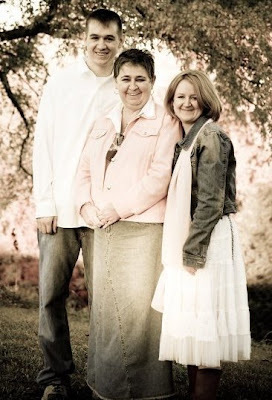 Our mother poured out a continuing selfless love, that she is still faithly exhibiting. She has attended every ballgame, school function, and continues to show the same support to her grand babies even though they are a two hour drive away. When I was five she use to reminded me to be nice and share with my brother, when I was ten she would remind me not to fight with my brother, as a teenager she would remind me to wash my face, drive safe, and not forget to give my brother a ride. Now I am grown ans she likes to remind me to not be to hard on my three boys ,they are only little once she says. Over the years my mother has become my dearest friend, a intense listener, and a back bone in helping me keeping my own sanity while raising my own children. She has persistently loved me even when I wasn't exactly lovable. She has never once stopped believing in us kids. To me she is the World's Greatest Mom. She is mine, and I am a part her, and she had a grand part in sculpting me into the woman I have become. Oh and don't fret she is still guiding me on many areas of my life like parenting and house keeping. She is an amazing housekeeper.....me not so much, but she is teaching me to be better at it just by example. I bet she doesn't even realize it. She is so beautiful, and just a golden light in my heart. LOVE YOU MOM!!! Oh and I am so so so sorry for all the mean, sneaky things I ever did in my childhood!! I hope you all enjoy my lovely Mother's answers to her interview questions. She talks about all the transition that has take place during her own motherhood adventure. Q: What the best thing about being a Mom? Q: What the hardest thing about being a Mom? Q: What is one of your all time favorite memories? A: Oh I have way to many ....Taking naps ..with one on each side of me singing ,till they fell a sleep.......holidays .....vacations! Q: Did your kids turn out like you expected? Q: What is your least favorite household chore? Q: What has been the most suprising aspected of Motherhood? Q: Do you feel different now that your kids are semi-grown ups? Q: What is it like to be called Nana by four grandchildren? Q: Would you do everything the same way if you had a Motherhood do over? Q: What is Mother's Day suppose to be like in your eyes? A: Well my dream mothers day is to have all my chicks home....I know that isn't always possible....just knowing that they are happy and healthy and have a good family life.....thats all any mother wants.......I have great kids ......they really have not given us any grief.....just so so much joy.....a true gift from God.....and I thank him dailey for them both....and their wonderful families.....we truly are lucky!